The concept of propagating a business to the target audience through influencers is gaining tremendous importance these days as it helps in building the credibility for the brand in the long term. But when it comes to Business to Business influencer marketing, it remains a tough ocean to sail, as every brand has a diverse set of customers across industries, and finding a substantial influencer across such a diverse group is a tough task. B2B influencer marketing requires substantial effort, but if performed perfectly it would impact the business tremendously. 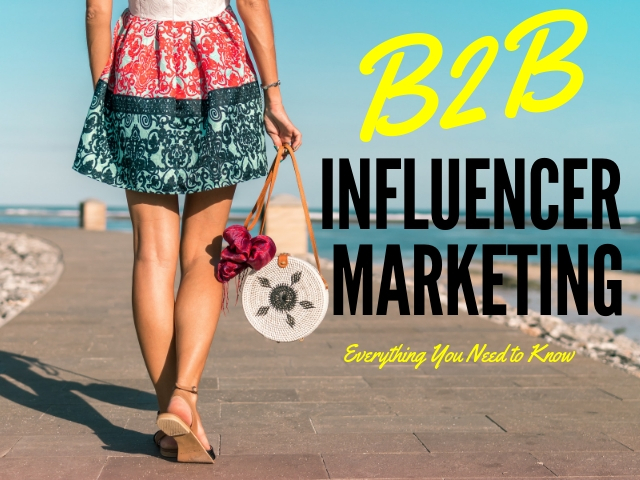 What is B2B Influencer Marketing? Influencer marketing is a stream of marketing that involves key leaders to portray a brand to the larger market. Brands inspire and hire influencers to promote their brand to their audience. Influencer marketing campaigns are mediated through social media elements and propagated through content so as to engage with the target audience. In the Business to Customer scenario, customers rely on two aspects, empathy and the details of the business, but in the B2B (Business to Business) world, customers would rely on their experiences with industry influencers on their personal lives. They offer excellent leadership and shine on the new business, thus making it more visible and desirable by the target audience. They offer access to high profile professional contacts and networks which are otherwise not possible to reach. They offer professional credibility in taking the business to the target audience. The impact of B2B influencer marketing takes a long time to root because the factors that define the B2B purchase decision are nuanced and hard compared to consumer purchases. Also, B2B purchases involve a number of decision makers, and it takes a longer time for B2B marketing to influence these decision makers. It may take at least 6 months for the B2B influential marketing to convert. Most of the companies tend to look out of their entity to look for fresh influencers. But in most of the cases, some of the best influencers with excellent knowledge about the brand are available within the organization itself. The main motto of marketing is to influence prospects, who are the future customers of the business; influencer marketing is all about influence those who influence these prospects. The best way to find an ideal B2B influencer is to identify whom the customers of a business are listening to and are reading about. Luckily, there are some tools to identify these influencers for a business. Unlike B2C business, where influencers are valued based on their strength in social media, B2B influencer marketing is gauged on their individual marketing viability, most of these influencers are indeed not available in the social media forums. Most of the B2B influencers are researchers, podcasters, authors, and speakers with little presence in social media. Unlike B2C influencers whose main job is to stay active on social media, B2B influencers have a job and are influential because of the job and position they hold. It is likely that in many instances the influencer would not be able to participate in the program, or in a way that the brand expects him to owe to his job restrictions. Thus it is required to research and activate influencers to avoid conflicts with them. It is important for brands to spend time educating the B2B influencers about the company, its customers, products, brand culture, and its competitors. This aspect should not be overlooked and brands should not think they are imposing their influencers. Influencers also would show interest in learning about the new product for if they enhance their knowledge on the product, they would be able to frame the campaigns better. Influencers are not to be spoon fed on the brand products and services, they are socially active individuals who would have enough and more knowledge on the existing brands in the market. Influencers have to create their own themes of content and investigate the ways to promote them and also on the ways to engage the consumers and promote sales. Microsoft is a giant in technology and is a renowned company globally. Recently they partnered with National Geographic for an influencer marketing campaign and brought in some of the famous adventure photographers for this B2B collaboration. It was called the ‘Make what’s next event‘ and the motto was to encourage young women to pursue the jobs they aspire. Microsoft posted thirty photos on the Instagram account of National Geographic and the campaign was launched on International Women’s day. The story of a women scientist or adventurist was the theme of these photos and the photos bagged more than 3.5 million likes in a day. Thus, Microsoft was able to read millions of people by partnering with the Instagram account of National Geographic. IBM has a vast customer base that spans financial services, banking services, educational and technological sectors. Finding an influencer who could attend such a diverse audience base is a tough task, but IBM faces this challenge by leveraging on employee advocacy. It went along the basic principle that its employees are the ones who created its products and are responsible for its sales. So it leveraged on its employees to reach its customers. Another unique example of IBM’s innovative B2B influencer marketing strategy is that it partnered with a fashion designer and created the first ever Artificial Intelligence-inspired saree through its IBM Watson AI platform. The saree was for the first time brought under limelight at the Vogue Women of the Year Awards. The launch projects the unique B2B influencer strategy of IBM, through a celebrity fashion designer. This brand believed in the concept that the best way to promote a company’s brand is to leverage on the existing customers, as promoting the business through its own customers would add more credibility to it and also influences the buying behavior of the target audience positively. It is true that potential customers would value and believe the recommendations made by the existing customers. Okta has framed videos of its customer’s testimonials with a number of statistical figures and live examples of how Okta helped them in enhancing their business solutions. The videos had its customers sharing their success stories and these videos helped bring more business. The content of these videos was converted into blog posts as well to be shared on social media channels. Landis+Gyr is a pioneer in the energy sector and have shown exceptional influencer marketing skills by leveraging on its employees for its B2B marketing. It picked up its potential employees who are very active on social media and used their channels to spread the word about its innovation and customer-centric values. Its social media campaign was a grand success and yielded excellent engagement and shares for the energy giant. Cisco is regarded as a leader in communication and networking technology. The company called its IT professionals as its champions and gave them incentives to share their knowledge and expertise on the products of Cisco on their social media accounts. Through the Champions program, these professionals are made to share their knowledge with other professionals and thus enhance their skills on social media. A number of videos and chats were created through these champions and famous influencers were featured in the company’s podcasts as well. Cisco was able to generate a huge volume of promotional content on a regular basis by using its employees as its influencers. SAP is a software giant known for conducting the Sapphire conference each year. This conference is able to bring together a number of industry experts together and helps them gain knowledge and upcoming trends in the software industry. The conference is capable of collecting 20k people in person and at least one million online viewers. In its 2016 conference, they used live video feature from Facebook and hosted live chats from industry giants. This influenced its online viewers tremendously and the videos were later uploaded in its blog posts and circulated on social media. Guest blogging is an important tool of B2B marketing, with the help of blogging, a brand could get industry experts to write some useful insights about business and share the same on its website. The insights offered by industry experts would influence potential customers in a positive manner. Guest blogging by an influencer is a successful marketing tool which could be done within a small time frame and within a limited budget. Point Blank SEO is a simple link building blog run by Jon Cooper. He also leveraged on the importance of guest blogging and found a tremendous increase in the number of visitors to his blog after he became a guest blogger on a different business website. Also, the number of visitors kept on increasing at a steady pace after he himself became a guest blogger. The brand leveraged its B2B influencer marketing strategy in his existing customers. It felt that its existing customers have the capacity to persuade new customers who will show exceptional levels of brand trust and loyalty. The company created a number of engaging videos based on the success stories of its clients and started promoting them. The videos were framed on a call to action basis, persuading the viewers to download their eBook. Price water house Coopers or in short the PwC is one of the leading firms in the world dedicated for accounting. To gain themselves a competitive edge they ran a tricky B2B influencer marketing strategy year and promoted the same on the social media under the hashtag Ballot briefcase. PwC was indeed responsible for bringing the ballots safely for the Oscars Ceremony every year. Many people are not aware of it, so they decided to use this strategy to promote their business better. They gave this briefcase the personality of a famous celebrity and carried the briefcase to a number of cities, made their employees pose with it and promoted the same on social media. They enhanced the visibility of their role associated with the Oscars. They repositioned themselves to appeal to the younger audience. They leveraged on their employees to generate the needed attention for their company. It is worth to mention here that PwC also won the best B2B award for this strategy. B2B influencer marketing is pretty tough compared to business to customers marketing and other forms of marketing tactics. But when it gets leveraged appropriately, it could be a huge hit for a business. One of the key lessons that B2B influencer marketing teaches is that the employees and customers of a business could be key influencers and businesses need not search for its influencers outside the company. When choosing an influencer for the business, it needs to take utmost care to maintain cordial relationship with them as the image of the business lies in their actions.